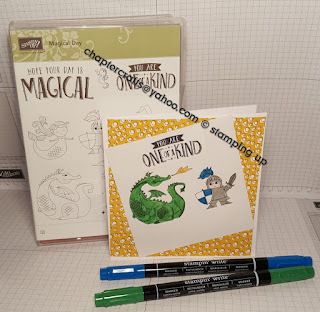 Hello again I'm here to show you the Magical Day stamp set from the spring summer catalogue from stampin up! I love this set. It has dies to go with the stamp and matching designer series paper as well. 4 15\16" x 4 15\16"
Whisper White card 4 3\4" x 4 3\4"
To colour in image using smoky slate, Pacific point,pink pirouette,garden green and cumber crush.